George Washington's attacks at Trenton on Christmas Day 1776 and at Princeton on January 3, 1777 saved the Revolution. The British army withdrew from New Jersey and was deprived of its fertile farmland for the coming campaign. In addition to the invaluable boost to American morale, from now on the British were tied to inadequate and unreliable supplies direct from Britain. Further, Washington's winter quarters behind the Watchung Mountains in Morristown effectively flanked any direct British advance on Philadelphia. After unsuccessful sparring in New Jersey in the spring and early summer of 1777, Sir William Howe decided to move the main British army by ship to Pennsylvania. He hoped to capture Philadelphia, the national capital, and live off the fertile farmland of the colony. Howe's action left Burgoyne's advance south from Canada unsupported and vulnerable. In part this led to Burgoyne's surrender at Saratoga. Sir William and his brother Admiral Richard Howe found the defenses of the Delaware River too strong and instead made the long voyage through the Chesapeake Bay, landing the 17,000 man army at Head of Elk, Maryland. After a skirmish at in Delaware at Cooch's Bridge, Howe continued his advance, heading north to Kennett Square, Pennsylvania - farther upstream the easily defensible Brandywine Creek. Washington placed his 11,000 man army behind the creek at Chadds Ford. The next day, September 11th, Howe attacked. Knyphausen vs. Maxwell with photos courtesy of Paul Mullin NEW! Clash of Arms maker of Brandywine and Germantown and 1777: The Year of the Hangman - Wargames from a local company. Destruction / Desecration of Brandywine Battlefield Published by the NPS. 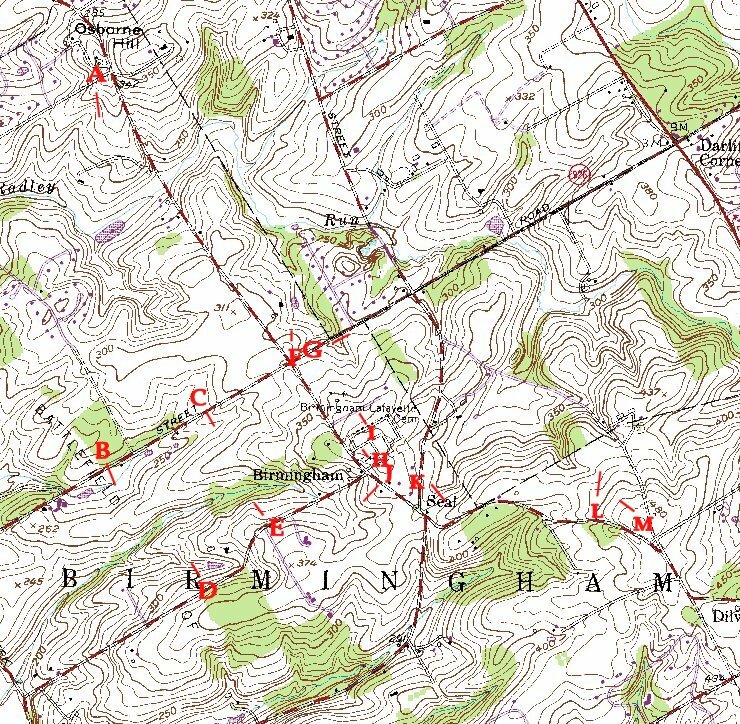 The letters on the map correspond with letter designations of the photographs. The lines give a rough idea of the directions the pictures were taken, but keep in mind that panoramas often show a much wider view. The east-west axis is a little over a mile, and the contours are ten feet. The map is old and does not show the new housing developments which are popping up over the battlefield. The dashed road north of "B" is the old Forks Road. (not the other more famous Forks Rd. to the east) The British right extended somewhere to the west of this road.